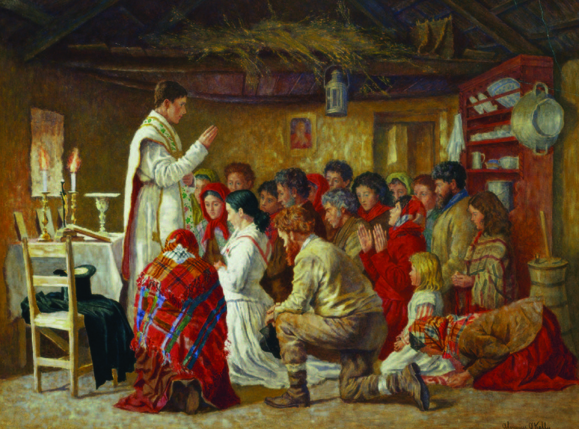 Mass in a Connemara Cabin, by Aloysius O'Kelly. Courtesy of the McMullen Museum. Boston College’s McMullen Museum of Art is giving visitors a rare look at the daily lives of Irish country people in the nineteenth century. Once thought to be an unpopular subject among Irish artists in the 1800s, who often focused on the grander “big house” themes and landscapes, the rural Irish population comes to life in this expansive and carefully curated exhibition. Rural Ireland: The Inside Story brings together a wide range of paintings, 65 in all, that depict the interiors of rural houses. Many are on loan from some of the leading galleries in Ireland and Northern Ireland, including the National Gallery of Ireland, Cork’s Crawford Art Gallery and the Ulster Museum, and some have never before been exhibited in the U.S. Together, they provide unique insight into the quotidian lives of the country Irish in the midst of political, social, and religious turbulence, and during the tough Famine years and the periods of immigration that ensued. Aloysius O’Kelly’s watercolor Mass in a Connemara Cabin, for example, shows a station being held in a rural home. James Brennan’s News From America depicts a young girl reading a letter from a family member who had emigrated to America to the rest of the family. Later paintings, like Gerard Dillon’s almost Post-Impressionist Yellow Bungalow, mark a turning point in Irish art as they adopted more modern styles and techniques. The paintings are accompanied by a vast collection of artifacts from Irish life during this time, from work benches and furniture to cooking utensils – the very household objects depicted in so many of the paintings. The exhibition also features a re-creation of a typical nineteenth-century hearth, the center of the home. Rural Ireland: The Inside Story runs through June 3. Visit www.bc.edu/artmuseum for more information. As a son of Irish immigrants to Britain, I am very moved by this image. Especially in the light of the current difficulties facing the Church in Ireland. It reflects very much the faith of my parents and grandparents and more distant forebears. I would very much like to obtain a copy. Can you advise if this is possible? One can be purchased from NGI. My wife and I spent part of our honeymoon in Ireland and purchased a print for the priest that married us!